Texas started out behind the eight ball in this one and never recovered. A 2-0 deficit in the first period was all San Diego needed to claim two points tonight in a 4-1 final. The Stars only goal came in the second period as AHL All-Star Joel L'Esperance ripped one to the top corner off the rush. "It seems to be a tendency right now that we have slow starts," said captain Justin Dowling. "We have to figure out a way to motivate ourselves to be ready right from the get go." Texas is now 1-6 in their last seven and snapped their home point streak at 12 (11-0-0-1). The road trip was a back-breaker for the club, "When we go on the road there and have a bad stretch, it zaps the life out of you. We have to figure out a way to battle out of this." The All-Star Break is coming at the best possible time for the Stars, who need to rest both their minds and bodies. Coach Laxdal noted, "We've played a lot of hockey here and now we can rest." Corey Tropp's tenth of the year came as the forward was left unmarked in front of the net. Ben Street found him from the corner on a solid dish for the opening goal. Three minutes later, Street got one for himself. The Stars lost a post-icing faceoff clean to the point, where Jacob Larsson wired it to the net with a tip by Street. It was a rough period for Texas, one of their poorest showings at home in recent memory. Texas would get one back in the second, but not before San Diego extended the lead to 3-0. It was a harsh goal as Texas had just had easily their best shift of the game to that point. In the offensive zone, Caamano, Hintz and Gurianov had a pair of chances but chased back to see a five-hole shot end up in their net. "We had some good looks there we didn't bury on," said Laxdal. "We just couldn't find the back of the net." Joel L'Esperance scored for Texas 90 seconds later to cut the lead to two. Sam Laberge found the All-Star forward on the rush. He wired one to the top-left corner. Colton Hargrove, Gurianov and Laberge all had great chances as the period continued, but good luck by netminder Kevin Boyle kept them out of the net. The Stars were buzzing as the frame ended and looked to push that momentum into the third even as they held a 2-13-2-0 record when trailing after two. Texas got their chances on the power play in the final frame but couldn't close the gap. As they pushed more, San Diego got their fourth, Ben Street's second of the night. Texas would empty the net with nearly four minutes remaining in the game. Philippe Desrosiers took the loss, dropping to 3-5 on the season, with 28 saves on 32 shots. Kevin Boyle was fantastic for San Diego, stopping 24 of 25. 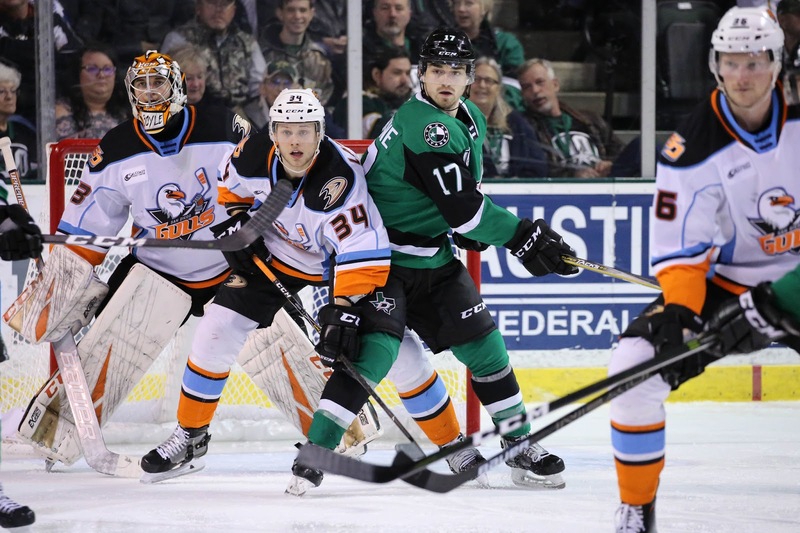 Texas is next in action on Thursday against Grand Rapids. Tonight’s attendance was 6,863, Texas's second consecutive sellout. Sam Laberge had a solid game despite the loss. Laxdal: "He brought a lot of energy. He's trying to stay in the lineup and he'll push ahead of some other guys. Other guys didn't have fresh legs."